Read the mythology, folklore, and stories to become familiar with the Gods and Spirits (alfar/dawrves/assorted wights) of the Heathen culture you are drawn to. Use this to get to know these Powers and to start to understand the worldview and cosmology. You can't read too much of this stuff, ever, but always keep it in perspective for what it is and avoid the trap of fundamentalism. Learn about your own ancestors and connect to them, whoever they are. The dead never truly leave us unless we forget them. Tell their stories, honor their memories, ask them for guidance and help in your life. Respect the wights of the land and your home. Learn about how the wights were and are understood and honored by the Heathen culture you are drawn to - be it Norse, Germanic, or Anglo-Saxon - and find ways to do this in your own life. Be an honorable person. Live a life that reflects the values you want to embrace, including honesty, trustworthiness, loyalty, and courage. If you give your word, keep it. If you commit to something, see it through. Take responsibility for your own life, the good and the bad; be proud of your accomplishments and be willing to make amends for your errors. Embrace reciprocity. Give as much as you get and seek balance between what you take and what you give. Following along with part 5 - offer to the Gods, ancestors, and wights to create reciprocity with these Powers. Offer in thanks and celebration, for blessing and protection. Offerings create a relationship between us and the Powers we honor that is important in our spirituality. Connect to your spirituality regularly by celebrating holidays, reading, and essentially living your faith. Heathenry isn't an occassional religion that you practice once in awhile or a hobby, its a way of life. Set aside some space, no matter how small, in your home to honor the Gods. Think about who the Gods are to you, and what part they play in your life. Which gods do you connect most strongly to and why? Who do you honor most often? While each Heathen culture has its own pantheon you will find that within that pantheon there will be a selection of deities - perhaps as few as three or four, perhaps as many as a half dozen or more - that you are particularly drawn to for a variety of reasons. Over time these Gods will be the ones who you form the strongest connections to, much as each historic community had specific Gods within the wider pantheon that they honored. And there you have it. You can add seeking community in real life or online as well, but I think that the heart of Heathenry starts with you and your own life. If you aren't a Heathen in your own life then all the community participation in the world won't make you one. That isn't to downplay the importance of community, which is a wonderful source of support, but if you can't be a Heathen without a community then you are missing the point altogether. In modern times runes are fairly well established as a means of divination, but are often criticized in Heathenry for not being historically used for that purpose. The truth is that we know the ancient pagan Norse and Germans used a system of lots for divination, but we don't know with certainty that the marks on the lots where runes, nor what each rune may have been interpreted to mean. We do, however, know that runes were used for magical purposes so it's not completely unrealistic to believe that the runes used so extensively in magic might also have been used as the marks on lots. many symbols of might and power,"
Which at least hints at the possible use of runes for divination. "For auspices and the casting of lots they have the highest possible regard. Their procedure in casting lots is uniform. They break off a branch of a fruit-tree and slice it into strips; they distinguish these by certain runes and throw them, as random chance will have it, on to a white cloth. Then the priest of the State if the consultation is a public one, the father of the family if it is private, after a prayer to the gods and an intent gaze heavenward, picks up three, one at a time, and reads their meaning from the runes scored on them. If the lots forbid an enterprise, there can be no further consultation that day; if they allow it, further confirmation by auspices is required." From this we can gather that the casting of lots was considered an important method to obtain answers to questions, especially those of ritual or communal importance. We also see that in Germania wood from a fruit tree was used and the runes were prepared fresh before each use. The exact ritual described involves throwing all the runes onto a white cloth and then looking up and blindly choosing three to answer teh question being asked. 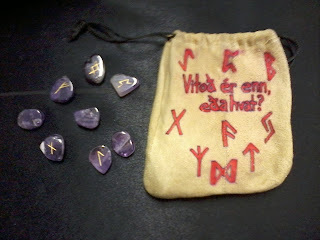 In a modern setting runes are certainly used and generally the meanings, at least for those with a more reconstructionist bent, are based on the old rune poems. 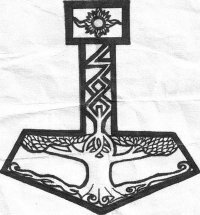 These poems which come from Iceland, Norway, and Anglo-Saxon England can be found here http://www.ragweedforge.com/poems.html and while they were likely originally a mneumonic device for learning the alphabet (or futhark as it were) offer insight into things associated with each runic symbol. These associations can be expanded out into meanings that can be associated with teh rune fo ruse in divination. There are also many good books on the market today that offer ideas and share the author's insight into possible divinatory meanings of each rune. I tend to recommend Diana Paxson's book Taking Up the Runes because it includes references and quotes from many other well-known authors as well as all of the original rune poems. The story also goes on to discuss "Beer" runes to carve on a drinking horn and the backs of your hands, with Nauthiz scratched on the fingernails, to keep other's from telling your secrets. "Help" runes are drawn on the palms of the hands of a midwife or her assistant to aid a mother in childbirth, and prayers to the disir are recommended. "Sea" runes must be carved on the prow and helm of a ship and burned into the oars for safety at sea. "Branch" runes are used, drawn on bark and leaf, to aid in healing. "Speech" runes are used for eloquence and "Thought" runes for wisdom. The challenge, obviously, is working out which rune is a "beer" rune and so on. Different modern authors and practitioners will have differing opinions on which should be what, and its important to keep in mind that it is all educated guess and experimentation. The "Sea" rune that works for me may not be the "Sea" rune that another person uses, and that is natural; certainly there was variation a thousand years ago as well. I'm doing something a little bit different today and offering my first music review. Yesterday I bought a copy of Kellianna's new CD Traditions, and after listening to it I decided it would be the perfect CD to review here. This is Kellianna's 5th release and a departure from her previous albums in several ways. Firstly, half of the twelve songs were recorded as duets: 1 with Kenny Klein, 2 with Wendy Rule, and 3 with Jenna Greene. Secondly, and perhaps more significantly, every song on the album - as the CD title suggests - is a traditional song, including a range of Celtic and American folk songs and even a few Gospel songs. The tracks are: She Moved Through the Fair, Early One Morning, Scarborough Fair, Danny Boy, John Barleycorn, Oh Shanendoah, The Ash Grove, Amazing Grace, Greensleeves, Ave Maria, Oh Tannenbaum, The Parting Glass. Fans of the previous albums who enjoy Kellianna's original pagan folk songs may be hesitant to try something so different from her but, believe me, its more than worth listening to. These folk songs are perfect choices and show off the beauty of her voice and range. The duets are well done and interesting; from the haunting rendition she and Jenna Greene sing of Scarborough Fair to the fun John Barleycorn she sings with Kenny Klein. My personal favorite is her acapella rendition of The Parting Glass, not only my favorite on the album but my favorite version of that song out of the dozens I've ever heard. I have enjoyed Kellianna's previous albums, but honestly I always preferred her chants to her songs; this album though is the perfect balance, showcasing her amazing voice with a range of songs that keep the listener engaged. Even the songs that I didn't expect to like, such as Greensleeves, were pleasant surprises. I believe that fans of Kellianna will enjoy this album just as much as fans of folk music looking for something new, who are in for a delightful surprise when they give this album a try. 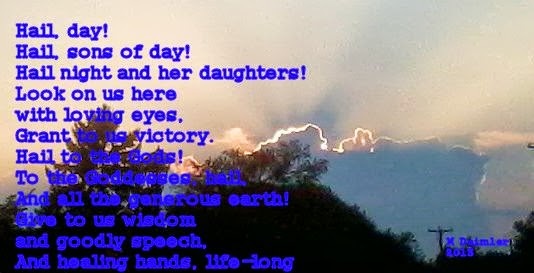 Hail Night and her daughters! And healing hands, all our lives." The afterlife is a very complicated thing in Heathenry, and it is something that is too often simplified in discussions and books to reflect a more classical or monotheistic model. People seem to have an endless desire to know where we go after we die and how we can get there that makes this a perennial question. The answer though is not at all simple because the Heathen understanding of the soul and of the afterlife was not simple. Many people focus on going to Valhalla, as if Odin's hall was the Heathen equivalent of the Greek Elysian Fields, the reward, the good place that everyone should seek to get to, but that is not so. First of all Odin's hall is described in the Prose Edda as a place of slain warriors, who, for fun, battle each other all day and drink and feast all night (Young, 1964). The mead, literally, flows freely there and the party - and fighting - never ends but its not a peacefully relaxing place. It is the gathering place of the Einherjar, the warriors who will fight for the Gods during Ragnarok. I tend to imagine it something along the lines of a really rowdy biker bar. It is also only one of many halls and, beyond that, the God's halls themselves are only one possible afterlife destination. Some people insist that the only way to get to Valhalla is to die in battle, and it is true that the Prose Edda says that the battle dead go there and that Odin sends the Valkyries out to choose those worthy of Valhalla (Young, 1964). However, Freya was said to have her choice of half the battle dead for her hall, Folkvangr as well, meaning that a battle death did not guarantee entrance to Valhalla. And you don't have to die in battle to go to Valhalla as in some cases those who died by other means went there. In Egil's Saga Egil says that both his sons have gone to Odin's hall, despite the fact that one drown and one died of a fever; Egil himself, although dedicated to Odin does not expect to go to Valhalla, but rather says he sees Hel waiting for him (Egil's Saga, 1997). Our Troth volume 1 also notes that Sigurdr and Baldr, both killed by weapons, go to Helheim, while Sinfjotli goes to Valhala after dying of poison (Our Troth, 2006). Besides the halls of Odin and Freya several other Gods are specifically mentioned in the lore. Unmarried maidens might go to Gefjon's hall, as it is said that she is attended by those "who die maidens" (Our Troth, 2006). In the Lay of Harbard Odin accuses Thor of taking the dead common men into his hall, in contrast to Odin's own preference for warriors, poets, and nobles (Bellows, 2007). Those who drown at sea are taken by Ran, caught up in her nets, and brought to her hall (Grimm, 1966). This gives us a wider picture of where a soul can go after death, but the Gods halls alone are only a small portion of the options available. The second most well known destination of the dead is Helheim. The Prose Edda tells us that those who die of age or illness generally go to Hel's hall, while liars, murderers, and oathbreakers go to Nastrond, both within Helheim (Young, 1964). Odin sent Hel to Niflheim to care for all the dead who came to her, and those who enter her realm belong to her. In the Edda Helheim is described as gloomy and terrible, yet elsewhere in other stories, such as Baldr's Dream, it is described as a rich feasting hall, with ale ready to welcome guests (Bellows, 2007; Young, 1964). I tend to believe the warm, welcoming version of Hel's hall is far more likely and I see Helheim as the realm of the ancestors. Some dead become mound dwellers; their souls going into the land. In Eyrbyggja Saga after Thorolfr's son drowns it is believed he goes into a hill on his father's land where he is welcomed with feasting (eyrbyggja Saga, 1972). In Gisli Saga a man who is called a friend of Freyr dies and is buried in a mound and it is said that no frost will form on the hill because Freyr does not want frost to come between them (Our Troth, 2006). In the Voluspa Odin goes to get the prophecy from an ancient seer in a mound and, indeed, the entire process of utisetta is based on the idea of contacting spirits within grave mounds. Additionally it has been suggested that some alfar are the male dead of a family as the disir are the female dead (Our Troth, 2006). Speaking of disir, it is entirely possible for a woman, after death, to become a disir, or idis, that is a specific type of spirit that watches over her family line (Our Troth, 2006). Reincarnation is also an old Heathen belief. Specifically it is believed that a soul might be reborn within a family line and that naming a child after a deceased ancestor can mean the rebirth of that ancestor in the child (Ellis Davidson, 1968). In some cases a child might be born with similar marks or the appearance of a deceased family member which could indicate a soul relationship (Our Troth, 2006). I have also heard it said, although I can't place the reference at the moment, that it was considered bad luck to name a child after a living relative for this reason. It is clear that there are a wide array of possible places for a soul to go after death. As individuals we do not seem to have much real control over where we might go when we die, so I honestly don't see the point in worrying much about it. Live a good honorable life while you are here and worry about the afterlife when you get there.